Whether you've already bought the battery, or are simply looking to expand your iON arsenal, the Sun Joe<sup></sup> iON16LM 40 V 16-inch Lawn Mower is the Core Tool for you! If you only want the basic tool without all the extras, this stripped-down version makes an ideal addition to your trove of yard and garden tools. Battery and charger sold separately. Ditch the gas, oil, noxious fumes, pull-cords and extension cords and meet the newest addition to the iON tool series the Sun Joe iON16LM Core Tool cordless lawn mower! This cordless dynamo is also engineered with a powerful brushless motor for increased battery efficiency, optimal motor performance and extended motor life (up to 2000 hours!) to keep your iON mowing strong season after season. Ideal for small to mid-sized lawns, the iON16LM Core Tool starts instantly with a simple push of a button and its ergonomic handle maximizes user comfort during use. The ECHO 58-Volt Cordless Lawn Mower is the most advanced, professional grade high voltage cordless Lawn Mower in the industry. Featuring a unique brushless motor designed to deliver superior power, run time and durability, the ECHO Lawn Mower can handle even the thickest grass. With a heavy duty 21 in. composite deck that is guaranteed for life, users can be confident in the longevity of the Mower. For added convenience, this Mower is equipped with a push button start and on board storage for an additional battery. This unit also allows users to adjust to 3 different handle positions for user comfort. When the job is finished, the Mower can be stored in a compact vertical or horizontal position by collapsing the quick-release handle. The Lawn Mower is backed by an industry-leading 90-day money-back guarantee, a 5-year consumer warranty and a 2-year commercial warranty. 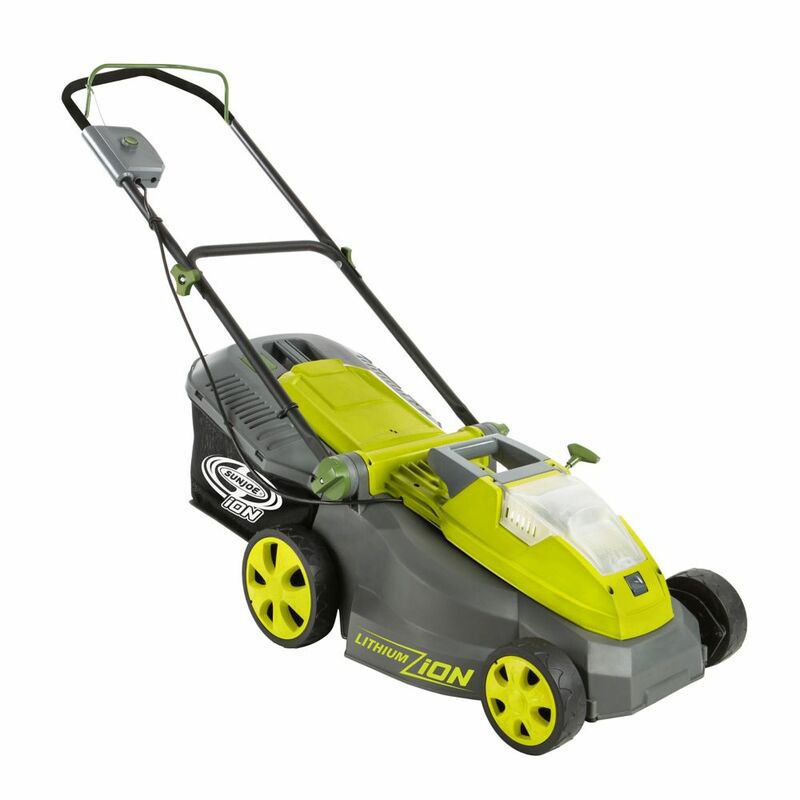 iON 16-inch 40V Cordless Lawn Mower with Brushless Motor Whether you've already bought the battery, or are simply looking to expand your iON arsenal, the Sun Joe<sup></sup> iON16LM 40 V 16-inch Lawn Mower is the Core Tool for you! If you only want the basic tool without all the extras, this stripped-down version makes an ideal addition to your trove of yard and garden tools. Battery and charger sold separately. Ditch the gas, oil, noxious fumes, pull-cords and extension cords and meet the newest addition to the iON tool series the Sun Joe iON16LM Core Tool cordless lawn mower! This cordless dynamo is also engineered with a powerful brushless motor for increased battery efficiency, optimal motor performance and extended motor life (up to 2000 hours!) to keep your iON mowing strong season after season. Ideal for small to mid-sized lawns, the iON16LM Core Tool starts instantly with a simple push of a button and its ergonomic handle maximizes user comfort during use. iON 16-inch 40V Cordless Lawn Mower with Brushless Motor is rated 4.2 out of 5 by 22. Rated 5 out of 5 by Pastor John from Not what I expected Last year I purchased the Snow Joe Cordless 40 volt iON Snow Blower. I was skeptical to say the least. However, it performed so well I sold my gas powered. This prompted me to try the Sun Joe 16LM Mower. I used it this all with the mulching attachment and was again impressed. I'm a fan! Rated 4 out of 5 by Almo from A joy to use I was pleasantly surprised by easy it was to cut my grass with this Sunjoe mower. Due to many days of rain my lawn had grown quite long before I could cut it bit the Sunjoe did a marvelous job without straining. It is so light to use and being cordless I can finish my grass cutting in record time. Rated 5 out of 5 by bonban from Lightweight and easy Love this powerful yet lightweight lawn mower. I can take it to my back hill and trim or cut large areas. I can even walk down the trail with it. Rated 5 out of 5 by NJKA from Great for the price Easy to operate & store. Runs really great & is easy to maneuver around the yard especially for a 70 year old. No gas to deal with, runs 45 minuets on a charge, I have 2 batteries so I can do full cut. I also have a Snow Joe for winter, same batteries. Really great units! Rated 5 out of 5 by Tasman from We have both the snowJoe and sunjoe, and they work great. With the snow Joe we can do three driveways and the side walk before the battery gets low. The sunjoe works just as good, although we don't often to the neighbors lawn. Great tools for sure. Beats gas power any day. Rated 5 out of 5 by Ed C from Excellent mower and company This was a replacement mower for the initial mower which had a faulty control. The replacement was there the following day and was perfect. This mower cuts great, is easy to handle (even for a 76 year old). Recommend this mower and company with out hesitation. Rated 1 out of 5 by HomeDepotCustomer from Would not start,even after I charged it.... Would not start,even after I charged it. why would i buy this lawn mower if it doesn't come with a battery and a charger? The core tool is an option for those customers who have already purchased another one of our units with the battery and charger included. This allows them to be eligible for the lesser price in not having to purchase a duplicate battery and charger.